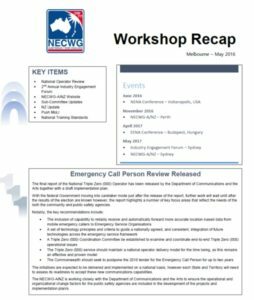 Another successful NECWG-A/NZ workshop was held in Melbourne between 24 and 26 May. Highlights included the 2nd Annual Industry Engagement Forum (see Post below) and discussion on the recently released National Triple Zero Operator Review. The next workshop is scheduled for November 23-25 in Perth.